The Eco ice AKM is suitable for commercial applications. It thus serves an area that previously could not be served by absorption refrigerators, which are more used more in process engineering or in large air conditioning systems. Unlike other known cooling systems that use heat as the drive, the Eco ice AKM is also designed for effective temperatures below 0°C. With our easy to use technology, you can also switch to air operation. Larger cooling capacities can be achieved here than those indicated for low temperatures. The Eco ice AKM is largely not dependent on electrical energy. It is powered by heat and is limited to heating temperatures below 100°C. 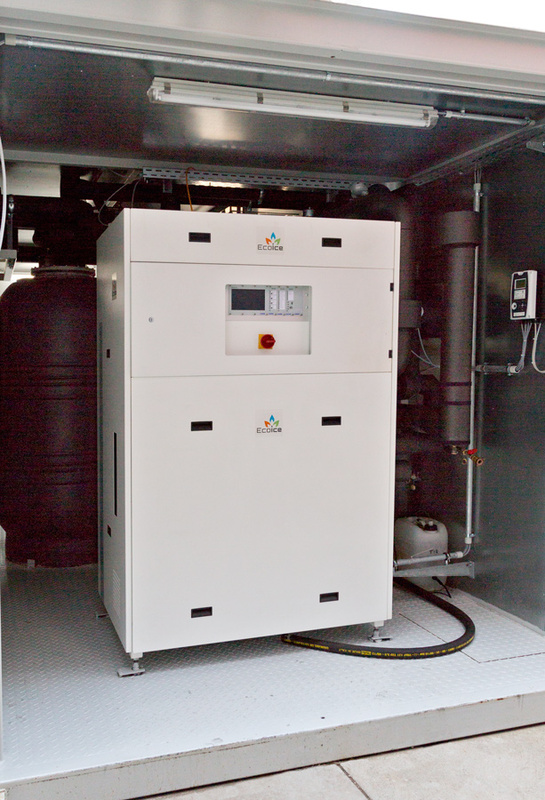 Like all sorption refrigerators, the Eco ice AKM does not require mechanical compressors. Only pumps and coolers cause noise. The vibration of mechanical compressors, often a nuisance for users, is not a concern with our system design. Exclusive use of stainless steel means high operational reliability and system availability is ensured. The Eco ice AKM is virtually maintenance-free and highly durable. We rely on climate-friendly, innovative ammonia-water refrigeration and thus on a natural refrigerant with no ozone depletion or global warming potential, which can be disposed in an environmentally friendly way after its use.